In three weeks, we'll get to watch Andy Dwyer and Ron Howard's kid fight some dinosaurs in Jurassic World. Dairy Queen is so excited it made a custom Blizzard packed with enough peanut butter and chocolate to lull even a T-Rex into a coma. The Jurassic Smash Blizzard features peanut butter cookies with chocolate chip cookie dough bites, chocolate chunks, vanilla soft-serve, and a peanut butter drizzle. 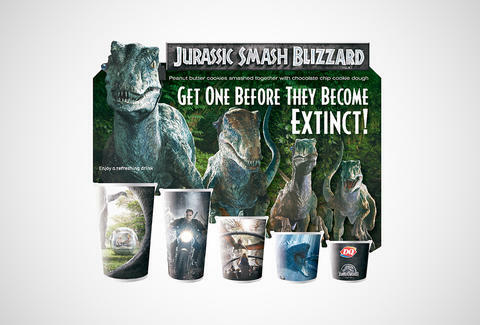 It'll come in one of six specially designed Jurassic World cups beginning June 1st, when it takes up residence as the Blizzard of the Month. Feel free to unleash your best dino sounds as you tear into the cookies -- unless you're trapped in a kitchen with velociraptors, of course. Kristin Hunt is a Food/Drink staff writer for Thrillist, and generally supports all dinosaur and peanut butter combinations. Follow her at @kristin_hunt.